Will 333 Carroll Street lose the growth that it gained on top, which is visible from a great distance? It's unclear, but neighborhood blogger Pardon Me For Asking reports that Council Member Bill de Blasio told the monthly Carroll Gardens Neighborhood Association meeting last night that the Department of Buildings has found issues with the building application as filed by original architect Robert Scarano. (Actually, the words used by PMFA is that Mr. Scarano "lied on the application.") The issue apparently involves the transfer of square footage from the basement to the roof. An "intent to revoke permit" letter has gone out, giving the developer until next week to respond. What it means, in effect, is that some sort of solution will have to be negotiated unless the developer intends to walk away from the building. 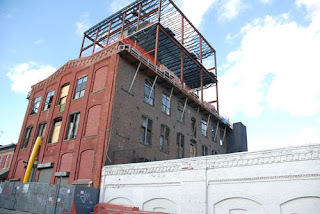 There is significant sentiment in Carroll Gardens to remove the the huge addition to the building. It's a monstrosity. This developer has a "history" with doing this sort of thing. I'm not against development—as long as it's in keeping with the neighborhood and the neighborhood can sustain the change. But I live a 1/2 block away from this and it's having an 8+ story high-rise in the middle of brownstone Brooklyn. I'm tired of these developers coming in, doing whatever they want, making a fast buck and leaving this sort of blight on those who are living there and raising families. I live around the corner from this thing and this developer is constantly involved in shady deals and badly designed and built projects. When is this ridiculous situation going to stop. I will be happy to see that top structure come down and then have something done with the old part of the building. It is a nice old building and there is no reason why something creative and beneficial cannot be done with it. You are all insane. From the picture it looks to be 5 stories!!! That's 7 stories LESS than the 12 story building Toll Brothers wants to put up right down the block from here! Would you rather the developer demolish the entire building and build 16 stories?? Yes, he could build 16 stories here!! Morons! Why are we morons? It destroys the view and is out of context. And yes, the Toll Plaza will rise like a mushroom cloud over Carroll Gardens. The shell is too nice to destroy..hopefully the new developer will see this. Just cut the f'ing cage down.